Launch from Cape Canaveral; landing near Grand-Turks-Islands in the Atlantic Ocean. The spacecraft was named Molly Brown. 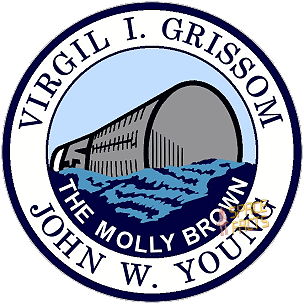 Virgil Grissom, hoping to avoid duplication of the experience with his Mercury flight in which the capsule sank after splashdown, named the Gemini 3 spacecraft Molly Brown, in a playful reference to the Broadway musical "The Unsinkable Molly Brown". 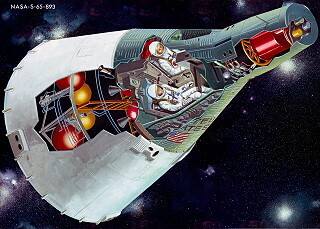 The Gemini spacecraft was a cone-shaped capsule consisting of two components, a reentry module and an adaptor module. 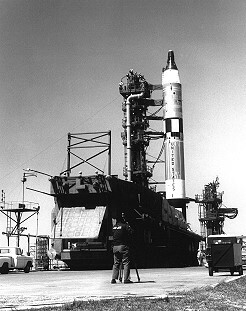 The adaptor module made up the base of the spacecraft. It was a truncated cone 228.6 cm high, 304.8 cm in diameter at the base and 228.6 cm at the upper end where it attached to the base of the reentry module. The re-entry module consisted of a truncated cone which decreased in diameter from 228.6 cm at the base to 98.2 cm, topped by a short cylinder of the same diameter and then another truncated cone decreasing to a diameter of 74.6 cm at the flat top. 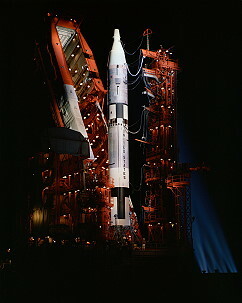 The reentry module was 345.0 cm high, giving a total height of 573.6 cm for the Gemini spacecraft. The adaptor module was an externally skinned, stringer framed structure, with magnesium stringers and an aluminum alloy frame. The adaptor was composed of two parts, an equipment section at the base and a retrorocket section at the top. 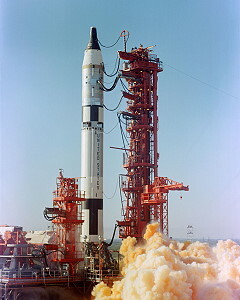 The equipment section held fuel and propulsion systems and was isolated from the retrorocket section by a fiber-glass sandwich honeycomb blast shield. The retrorocket section held the re-entry rockets for the capsule. 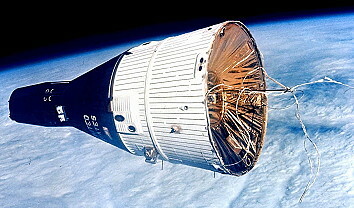 The reentry module consisted mainly of the pressurized cabin which held the two Gemini astronauts. Separating the reentry module from the retrorocket section of the adaptor at its base was a curved silicone elastomer ablative heat shield. The module was composed predominantly of titanium and nickle-alloy with beryllium shingles. At the narrow top of the module was the cylindrical reentry control system section and above this the rendezvous and recovery section which holds the reentry parachutes. The cabin held two seats equipped with emergency ejection devices, instrument panels, life support equipment, and equipment stowage compartments in a total pressurized volume of about 2.25 cubic meters. Two large hatches with small windows could be opened outward, one positioned above each seat. 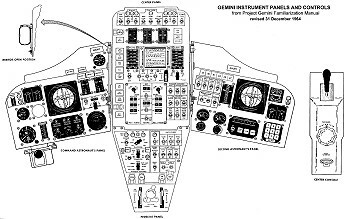 Attitude control was effected by two translation-maneuver hand controllers, an attitude controller, redundant horizon sensor sytems, and reentry control electronics, with guidance provided via an inertial measuring unit and radar system. 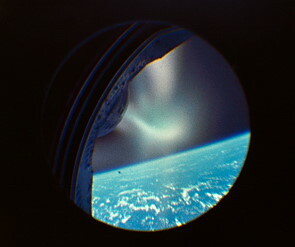 The orbital attitude and maneuver system used a hypergolic propellant combination of monomethylhydrazine and nitrogen tetroxide supplied to the engines by a helium system pressurized at 2800 psi. Two 95 lb translation thrusters and eight 23 lb attitude thrusters were mounted along the bottom rim of the adaptor, and two 79 lb and 4 95 lb thrusters were mounted at the front of the adaptor. Power was supplied by 3 silver-zinc batteries to a 22- to 30-volt DC two-wire system. During reentry and post-landing power was supplied by four 45 amp-hr silver-zinc batteries. Voice communications were performed at 296.9 MHz with an output power of 3 W. A backup transmitter-receiver at 15.016 MHz with an output power of 5 W was also available. Two antenna systems consisting of quarter-wave monopoles were used. Telemetry was transmitted via three systems, one for real time telemetry, one for recorder playback, and a spare. Each system was frequency-modulated with a minimum power of 2 W. Spacecraft tracking consisted of two C-band radar transponders and an acquisition-aid beacon. One transponder is mounted in the adaptor with a peak power output of 600 W to a slot antenna on the bottom of the adaptor. The other is in the reentry section, delivering 1000 W to three helical antennas mounted at 120 degree intervals just forward of the hatches. The acquisition-aid beacon was mounted on the adaptor and had a power of 250 mW. 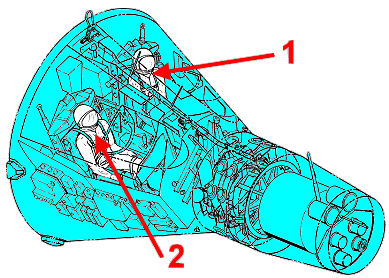 At the time of reentry, the spacecraft would be maneuvered to the appropriate orientation and equipment adaptor section would be detached and jettisoned, exposing the retrorocket module. 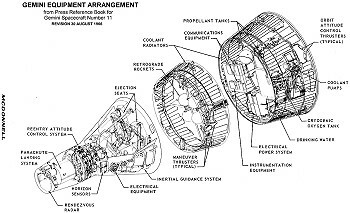 The retrorockets consisted of four spherical-case polysulfide ammonium perchlorate solid-propellant motors mounted near the center of the reentry adaptor module, each with 11,070 N thrust. They would fire to initiate the spacecraft reentry into the atmosphere, with attitude being maintained by a reentry control system of 16 engines, each with 5.2 N thrust. The retrorocket module would then be jettisonned, exposing the heat shield at the base of the reentry module. 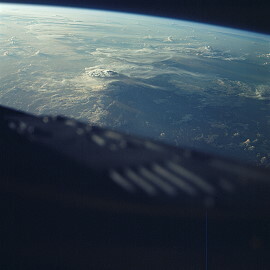 Along with the ablative heat shield, thermal protection during reentry was provided by thin Rene 41 radiative shingles at the base of the module and beryllium shingles at the top. Beneath the shingles was a layer of MIN-K insulation and thermoflex blankets. 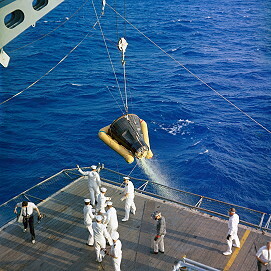 At an altitude of roughly 15,000 meters the astronauts would deploy a 2.4 meter drogue chute from the rendezvous and recovery section. At 3230 meters altitude the crew releases the drogue which extracts the 5.5 meter pilot parachute. The rendezvous and recovery section is released 2.5 seconds later, deploying the 25.6 meter main ring-sail parachute which is stored in the bottom of the section. 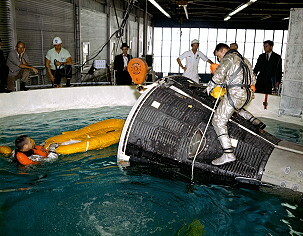 The spacecraft is then rotated from a nose-up to a 35 degree angle for water landing. At this point a recovery beacon is activated, transmitting via an HF whip antenna mounted near the front of the reentry module. 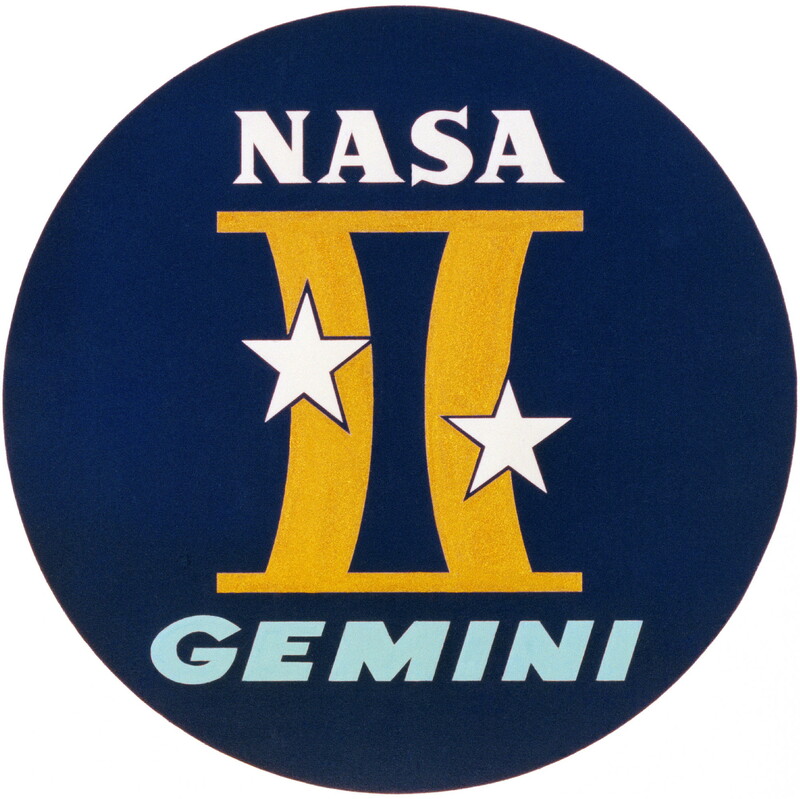 Gemini 3 was the maiden flight of the new Gemini capsule. 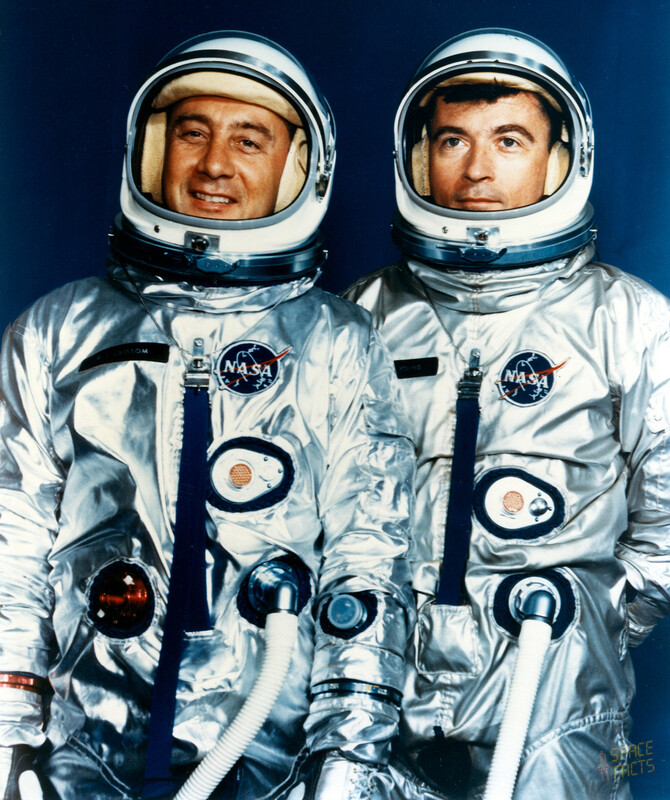 For the first time, there were two astronauts on board and Virgil Grissom became the first in spaceflight history, who flew twice. His first mission was the ballistic flight of Mercury 4. 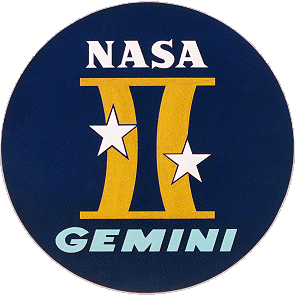 The main goal of this flight was, to test the maneuverable Gemini spacecraft. In space, the crew fired thrusters to change the shape of their orbit, shift their orbital plane slightly, and drop to a lower altitude. 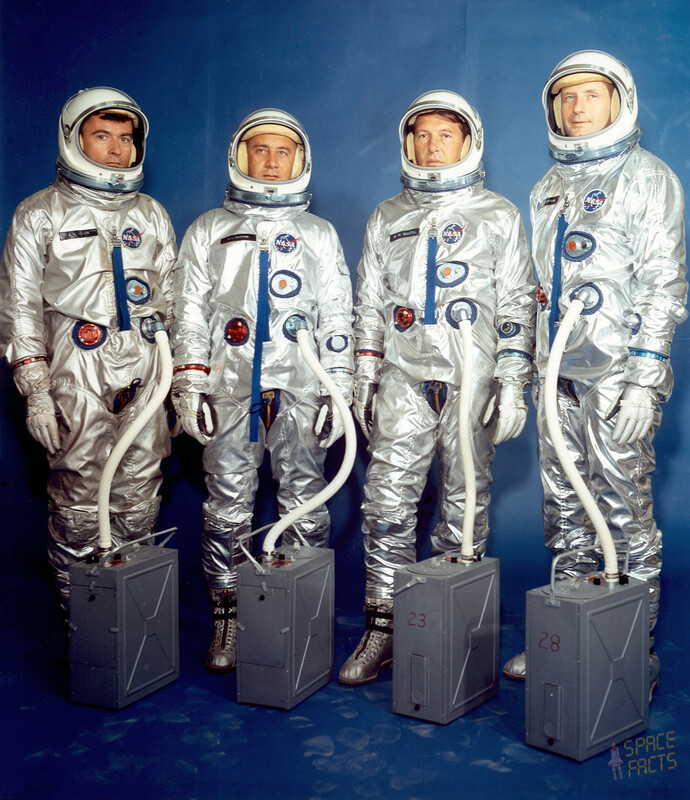 The astronauts made their first orbit change an hour and a half into the flight. 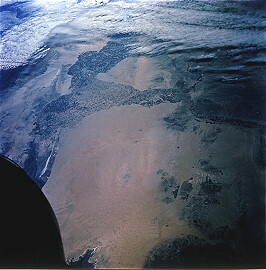 The burn lasted 75 seconds and moved them from a 122 by 175 kilometer orbit to a nearly circular one with a drop in speed of 15 meters per second. The second burn was 45 minutes later when the orbital inclination was changed by 0.02 degrees. The last burn came during the third orbit when the perigee was lowered to 72 kilometers. There were also three scientific experiments, which failed partly. The first was an experiment testing the Synergistic Effect Zero Gravity on Sea Urchin Eggs. A lever essential to the experiment broke off when pulled. The second involved the photographic coverage objective. It was only partially successful due to an improper lens setting on the camera. Interesting for the media was, that John Young had "smuggled" a sandwich into the spacecraft, which caught the problem, that the crumbs it released could have wreaked havoc with the crafts electronics, so the crew were reprimanded when they returned to Earth. 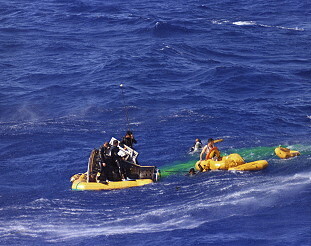 The crew manually landed their spacecraft in the Atlantic Ocean, thus performing the first controlled reentry. Unfortunately, they landed much farther from the landing zone than anticipated, about 97 km (60 miles) from the recovery ship USS Intrepid. They had to wait 30 minutes for the helicopters. On descent, the capsule shifted from a vertical to horizontal attitude under its parachutes. 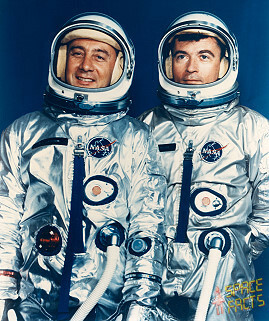 The change was so sudden that Gus Grissom cracked his faceplate (made of plexiglas) on the control panel in front of him, John Youngs faceplate was scratched.